Teton Interagency Dispatch Center, located in Moose, Wyoming, is an all-risk dispatch management and resource mobilization unit in western Wyoming. 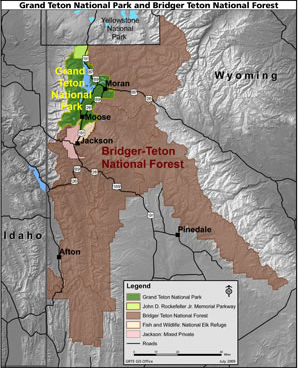 The dispatch center serves Bridger-Teton National Forest, Grand Teton National Park, and John D. Rockefeller, Jr. Memorial Parkway. as well as wildland fire and prescribed fire activities for the U.S. Fish & Wildlife Service (National Elk Refuge), Wyoming State Forestry (Teton Zone), and County Fire Services for Teton and Sublette counties and the northern portion of Lincoln County. The Fire and Aviation Management programs within the Bridger-Teton National Forest and Grand Teton National Park are integrated to provide a professional and innovative interagency fire program. While they are the primary participants in Teton Interagency Fire, they work closely with the National Elk Refuge, Wyoming State Forestry, and Teton, Lincoln and Sublette counties. Cooperation is key, not only during fires and all-risk incidents but during all aspects of fire and incident management, from the training and planning through responding to an incident.